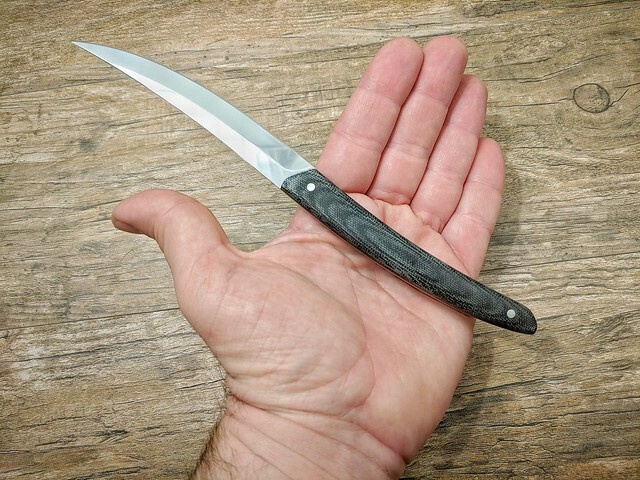 Discussion in 'Dogwood Custom Knives' started by DavidCAndersen, Aug 27, 2018. The following review was originally intended to appear on The Truth About Knives, before the new corporate owners unceremoniously pulled the plug on us. I was a good ways along on the writing process and didn't want it to go to waste (plus, I wanted to keep the knife lol!) so I reworked it a bit so I could post it here. Hope you all enjoy, and thanks Dan for the opportunity! Kitchen knives have been on the upswing in recent years and Dogwood Custom Knives’ Dan Eastland has been at the forefront of that trend. 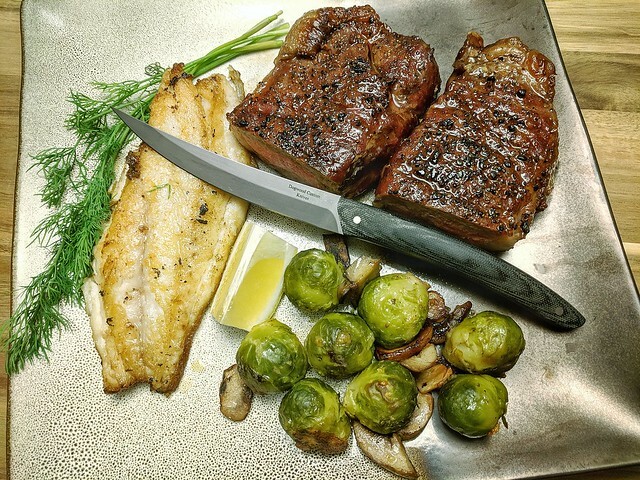 His new Fish & Fowl pattern serves multiple roles: small game (as the name would suggest) in the field, and boning and steak knife duty in the kitchen. I received this knife gratis from the maker at the BLADE Show this past June, and I am eager to see how well it can do those jobs. There are actually two tiers of the Fish & Fowl. The model I am test driving is the American-made production model. 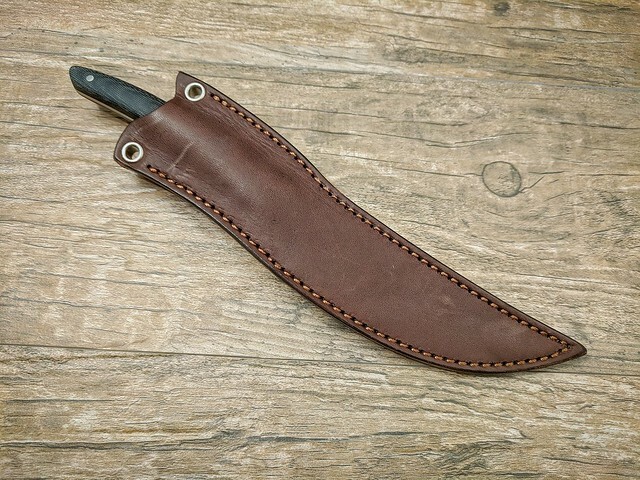 It comes with either black or natural micarta scales with 3/32” thick 440C steel priced at $98 sans sheath. An extra fifteen bucks will get you a nice leather hip sheath by JRE Industries. Mr. Eastland also produces full custom versions with even thinner particle steels, and the sky is the limit on handle and sheath choices. You would never know from the construction that this knife is the “lesser” version; everything is perfect on this example. The blade itself has a polished finish with a mid height flat grind. The edge itself was laser sharp, even after spending the weekend on display at BLADE Show. 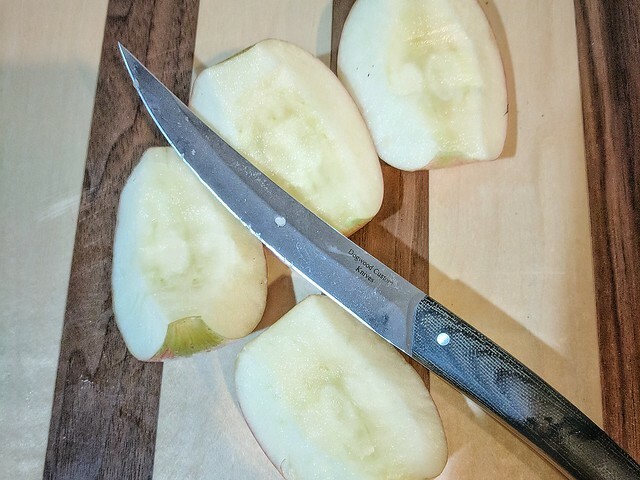 The knife has enough blade length to make it meaningfully more useful than a paring knife. Many 3-piece knife sets slot a utility blade in between a chef and paring knife, and the Fish & Fowl is enjoyable to use in this role. For the first month I had the knife, I brought it to my day job to use it on my lunches. 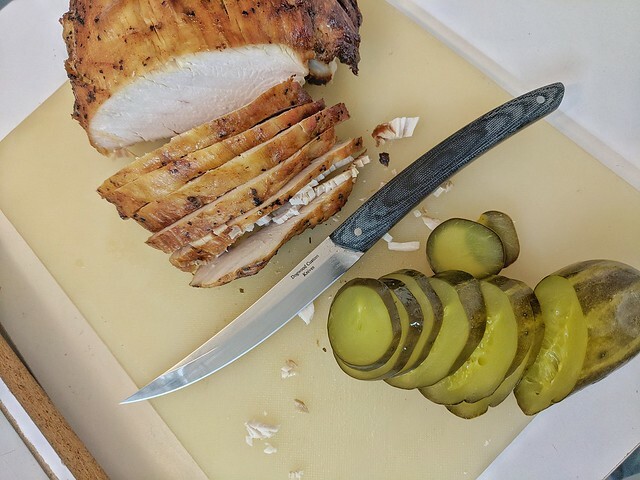 I like to make my sandwiches fresh, and the Fish & Fowl ably did everything I needed it to… from cutting pickles on the bias, onions, slices of meat from whole turkey breast, to splitting the sammich. 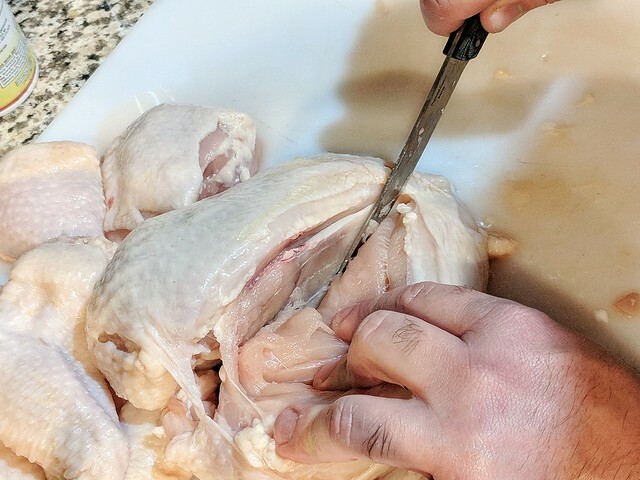 As a boning knife, the first task I put before the Fish and Fowl was breaking down a whole chicken. 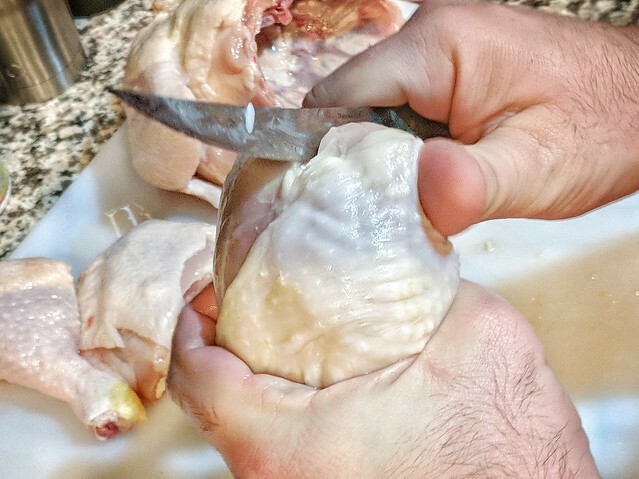 As expected, the knife had no problem navigating through joints to segment the bird. I was also able to carve the breast away from the bone with ease and butterfly it neatly. This knife can definitely live up to the “Fowl” part of it’s name, but what about the “Fish”? It was time for some surf and turf, so the wife and I picked up some top sirloin and a whole red snapper from the local fishmonger. Long story short, the Dogwood Fish & Fowl made easy work of removing the head. The spine of the knife even worked well as an improvised fish scaler, and soon all that remained was to fillet the meat. 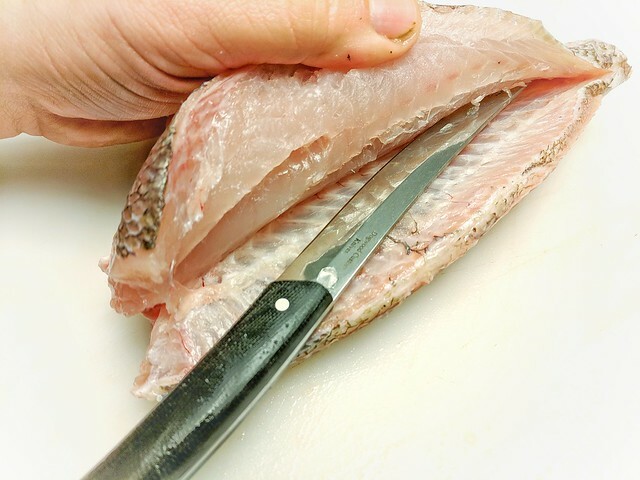 Of course this was no problem; the sweeping profile of the knife made the job look easy and soon I had two fillets ready to go. A little salt and pepper, garlic, some lemon, fresh dill, and a cast iron skillet older than I am finished the job. With fish and fowl both dispatched, what of other kitchen tasks? To further test cutting board prowess, I threw a heap of produce at the Fish & Fowl while prepping a salad. 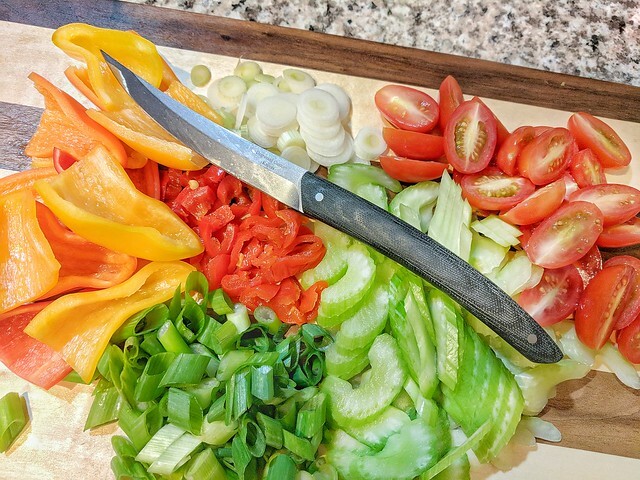 A paring knife might have been better for some of the veggies (sweet peppers) while a chef knife would normally be pressed into service for others (celery, scallions, grape tomatoes). 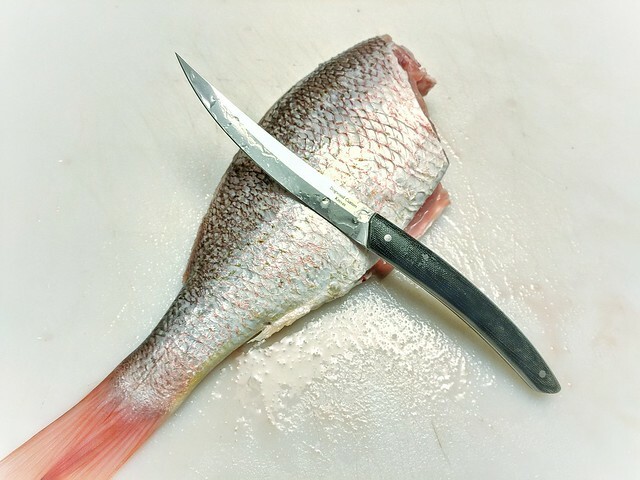 That said, the Fish & Fowl still produced the clean cuts needed for the dish.